The Superdraft is seen as the curtain-raiser for every MLS season. It takes place at the start of every year just as clubs are returning to pre-season action. Earlier this year was the twentieth draft held in the league’s history and it is targeted by standout college players as their route to becoming professional. But back in 2000, just the fifth season since the MLS’ formation, it was a brand new concept, a concept that Birkenhead-born Stephen Armstrong was set to be part of. The Superdraft was brought in to replace the old college draft system which had been used in the first four years of the league. Having been born in Birkenhead on the Wirral, Armstrong moved with his family to South Africa as a three-year-old. In 1995, he represented South Africa at under-23 level as they were unsuccessful in qualifying for the 1996 Olympics in Atlanta. However, he would still head to the States the following year anyway to study at Butler University in Indianapolis. Several years later and after the first round of the draft saw future Premier League players Carlos Bocanegra and Bobby Convey be selected, Armstrong would be the first choice of the second round, the 13th pick overall. When DC United made their choice, he would be confirmed in history as the first ever English-born player to be selected in an MLS Superdraft. It was no surprise that the forward was chosen so high up – he had been a star at college level, scoring goals so regularly that he would become Butler’s third-highest scorer in all time. However, he would not take up his chance to play in MLS straight away, despite being selected. H instead decided to return to the continent of his birth to begin his professional football career. “A South African friend of mine had connections in Sweden and it sounded like an exciting opportunity,” he says about his first professional chance. His time in Sweden was with Västra Frölunda a team currently in the fifth-tier but back in 2000 when Armstrong was on their books, they were in the top flight. He went on to make 12 appearances scoring once before an opportunity he couldn’t refuse came about. A chance to head to country of his birth. A chance to play under a legend. “It was certainly a great experience to be playing in England – Graham Taylor was the coach at the time who gave me the opportunity,” he says. Clearly the scout was impressed as in October 2000, Armstrong joined the Hornets, who at the time played in the First Division. He made his debut in December, away to Crystal Palace, but his chances at the club were limited and he would go on to make just two more appearances from the bench. He was also often used as a left-midfielder during his time back in the UK. After his spell in Hertfordshire came to an end, DC United finally managed to convince the Birkenhead-born college star to sign for them, more than 16 months after they first thought they had their man. His initial impact on MLS was not as big as he had hoped as he was played in a variety of positions under manager Thomas Rongen. Having previously played as a forward and as a winger, he had been asked to played left back on a few occasions. The following year, he was traded to Kansas City Wizards where a two year spell brought regular game time, especially in his first season when he scored three times and contributed six assists. He would miss the 2004 season through injury before returning to action in 2005 with Columbus Crew, where he would finish his MLS career. Having made 71 appearances in the competition himself, Armstrong is delighted to see how much the league has progressed ever since. “The league was still in its infancy back then,” he says. “The standard was decent but nothing like the level of today. The league has matured and come a very long way. It’s incredible to see all the teams having their own stadiums now and filling to capacity nearly every week. After leaving Columbus, Armstrong joined second-tier side Charleston Battery where would go on to become a legend for the club, playing in six seasons and making over 100 appearances. He would also be part of the side who lifted the USL Second Division title in 2010, his penultimate season with the side. It was a happy ending for his career but he still wished a few things had gone differently. “I enjoyed the opportunity to play football in the USA but I wish I had stayed and played a few years in Europe before returning to the States. “I also would have liked to have played in MLS for longer but I was coming off a four month stint where I’d had three surgeries [before joining Charleston]. Having retired in 2011 at the age of 35, Armstrong, who still lives in Charleston working in medical sales, is still involved in the game as he coaches youth football and plays in some local leagues matches. He also cheers on his beloved Liverpool every weekend as he tunes in to watch the Premier League from across the Atlantic. 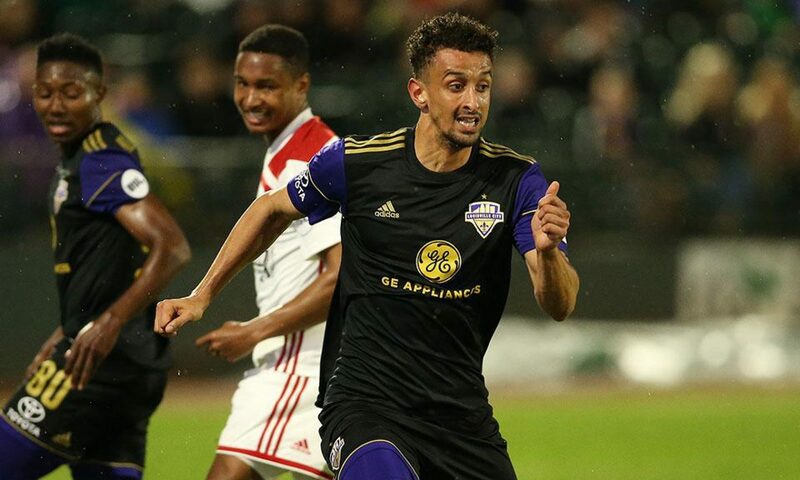 He admits he still misses the intensity and physicality of playing at a higher level but the Birkenhead-born man has had some career and will always be the first Englishman to have been selected in an MLS Superdraft.